Dead by Daylight Updates from the Past 2 Dev Streams! It's out on Steam already and we have a trailer! 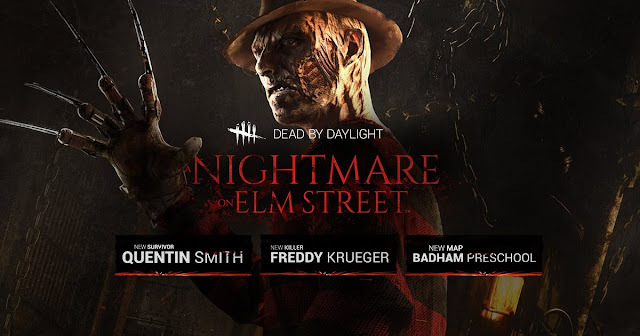 Unfortunately, we still don't have a Console release date yet for the Nightmare on Elm Street DLC. Some of this changes were talked about but they are still testing them before deciding which goes live in a future patch. They are also working on a new design with the 'Terror Radius' during a chase which will make a 'high skilled survivor have a harder time against a killer'. 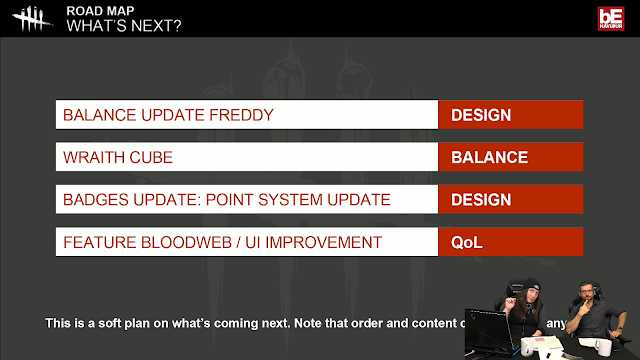 Visual upgrades for Freddy and his actions. 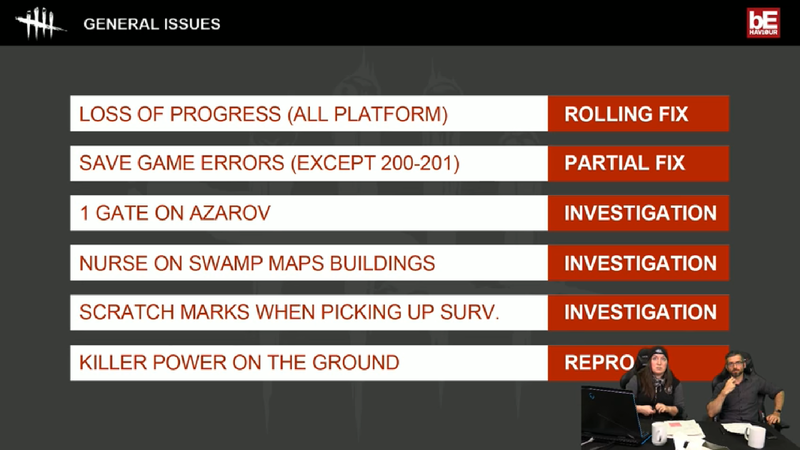 Issues that they are looking at.. 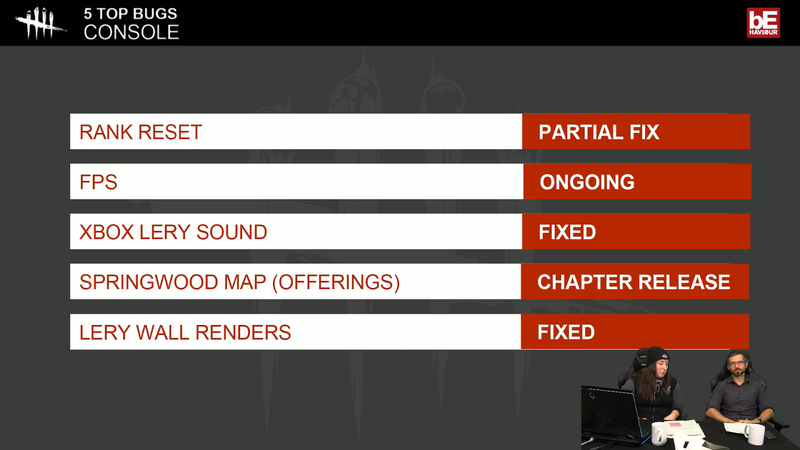 So the Springwood Map is not released for Public Matches yet so for those who are using Offerings to get into the Map, it won't work. However, you can play it on the "Kill Your Friends" Mode. 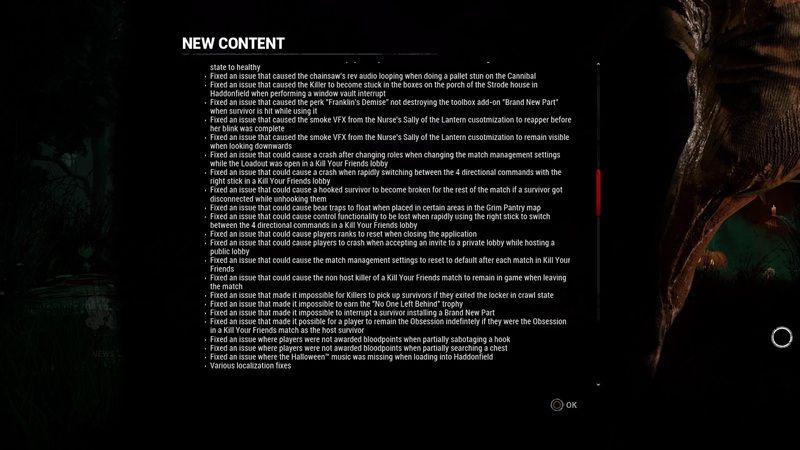 There will points awarded for Stealth game-play in the future and this will come with the Badges Update where you can earn Badges if you achieve certain goals. In #75, it was mostly updates about the new DLC.. explaining details about the new characters and how the new Perks work. They already talked about the Killer Perks in the previous Stream. You can check that out here. 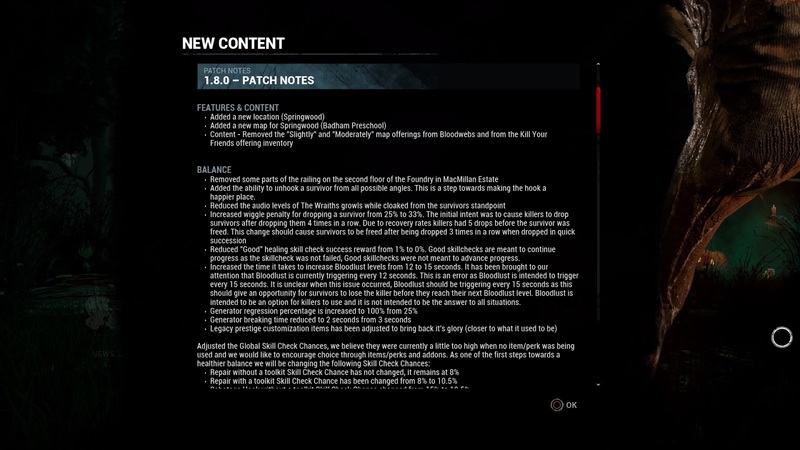 New Survivor Perks for Quentin Smith. Wake Up! : This is a direct counter to Freddy's Perk. If equipped and after all Generators are powered, the Survivor will be able to see the Exit Gates at all times. When you interact with the Exit Gates, your aura is shown to all other Survivors. Opening the gates is also faster if equipped. Vigil: All negative effects end faster. Pharmacy: It allows the user to search chests faster and make less noise, with the first chest searched, giving a guaranteed MedKit. 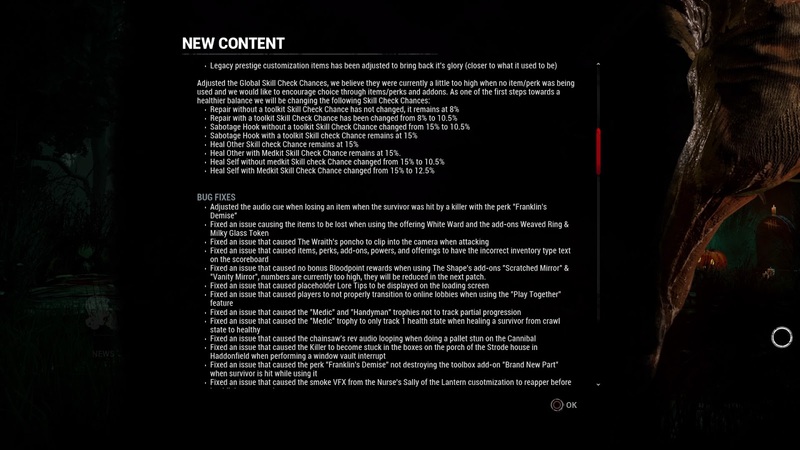 - Slightly & Moderately Map Offerings removed - It was to improve the quality of items that you receive on the Bloodweb and they will be keeping the Map Offerings that will guarantee you to play on the Map. 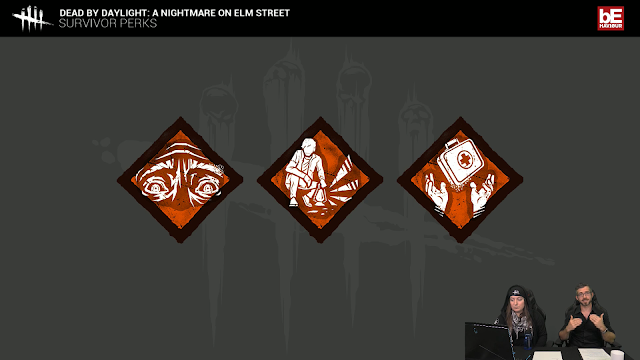 Map Offering thats you already have will stay in your inventory (and they still work) but they will stop appearing on Bloodwebs from now. Great decision I feel, I hated these Offerings and don't ever spend on these unless I was forced to or on my web leading to a better Offering. 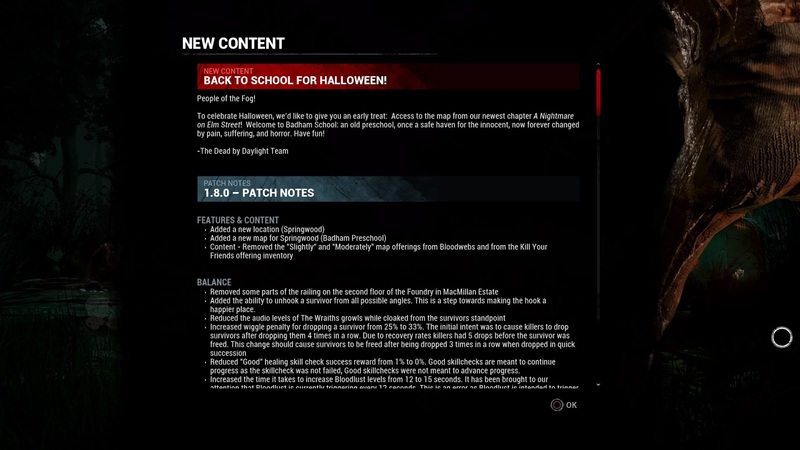 Bloodpoint Multiplier for Events - Ok, so Dave started a rumour that it would be a Quadruple Bloodpoint Event for Halloween as a joke and it ended up being a Double BP event. Now they have said that 'crazy' multipliers probably won't happen because when they did the Triple BP back in August, it literally 'broke the health' of the game. Fair enough, it was a nice way to start things rolling but didn't see it happening too often. 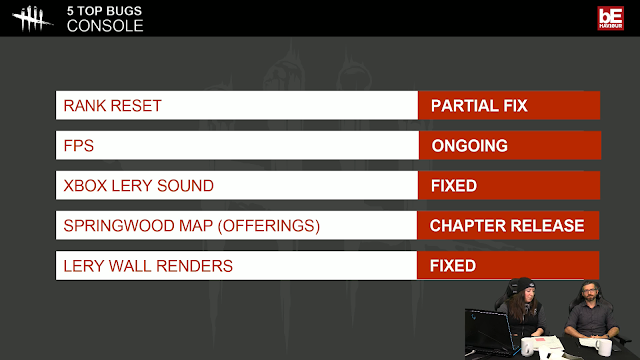 More Cosmetics - Definitely in the works as they showed in previous Streams. You can see some of them here. - Railings on 2nd floor of the Foundry in MacMillan Estate removed: A huge sign of relief for Killers, considering some Survivors were abusing the time taken for a Killer to walk down a floor before hooking. - Rotating hooks: Added to the game. This time, it's a positive sign for the Survivors. Definitely a huge help against 'Face-camping' Killers. and here's more from the latest Patch Notes..
Good stuff and hope you had a wonderful & productive week from the Halloween Double Bloodpoint Event! Bloodborne Comic announced for 2018!